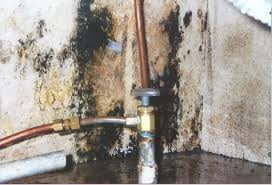 Microbial growth on building materials is always an undesirable occurrence and will often lead to some type of health symptoms in su sceptible individuals. A specific fungi, Stachybotrys chartarum also called atra, has gained significant notoriety in the scientific, medical and legal community. Stachybotrys can contribute to specific health symptoms if sufficient exposure occurs. A number of personal injury lawsuits have been filed against restoration contractors for exposing occupants to its spores and mycotoxins. There are numerous species of Stachybotrys, but Stachybotrys chartarum (atra) has been determined to cause health effects which necessitate precautions being taken when working in environments contaminated with this organism. Stachybotrys chartarum is a greenish-black fungus that can grow on wet material with a high cellulose and low nitrogen content. 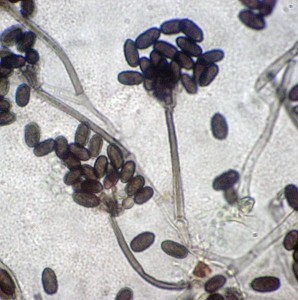 The color of visible growth of Stachybotrys is due to the spores. Spores are the reproductive bodies of fungi and are analogous to the seeds of a plant. While growing, Stachybotrys colonies are moist (slime mold) and the spores are not easily aerosolized, but the spores can easily become airborne during demolition or when dry. Stachybotrys chartarum can be found world wide growing on materials which high cellulose content such as paper, wallpaper, drywall paper, fiberboard, gypsum board, particle board, seeds and textiles. For Stachybotrys to grow, these materials must be wet for sometime (7 to 12 days). It grows best at temperatures which are comfortable for humans. Chronic leaks or moisture conditions promote gro wth of Stachybotrys. Inadequately dried building materials in structures which have sustained moisture intrusions due to rain, plumbing floods or other causes, are susceptible to the growth of the fungi. Gypsum boards behind waterproof wall coverings are particularly susceptible because moisture and humidity levels can not dissipate rapidly. Unless a moisture survey is conducted, the excess moisture may go undetected long enough for Stachybotrys growth to occur. Toxic metabolites called trichothecene mycotoxins can be produced by Stachybotrys chartarum. These mycotoxins are a normal part of the metabolism of these fungi under certain conditions, but can cause health symptoms in humans and animals exposed to significant quantities. Once produced, the toxic compounds remain chemically stable for many years. Animals are most often affected by these fungi from eating contaminated feed. However, the toxins produced can also irritate the skin and the mucosal membranes in humans. The chemicals are toxic when inhaled and can suppress the immune system. The most significant route of exposure is inhaling particles or spores and mycotoxins. 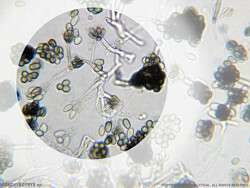 If Stachybotrys chartarum spores are released into the air, there is a potential for allergic, respiratory or immunological symptoms to develop or become exacerbated. 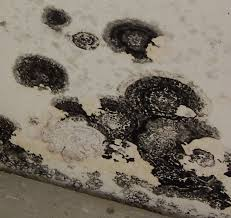 Stachybotrys chartarum is one of many toxin producing mold species. How do I know if Stachybotrys chartarum is present? If there are health complaints from occupants which correlate with possible exposure to Stachybotrys, a survey should be conducted by qualified professionals. An experienced environmental mycologist can easily identify Stachybotrys spores from a spore trap sample, surface sample or in bulk samples. Most Stachybotrys spores are not able to grow under laboratory conditions so testing by culturable methods which require growth of the organism are not reliable methods for determining the presence of this fungus. Scotch tape lift samples or swab surface samples are an easy way to identify Stachybotrys on the job site. 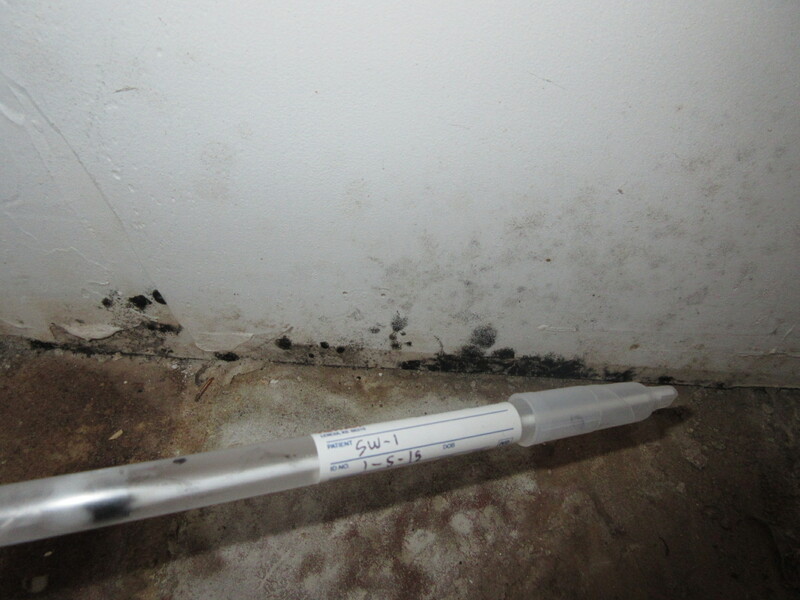 When small patches of black mold growth are discovered on building materials, a piece of scotch tape or a swab is pressed gently to the surface and can lift a sample which an experienced environmental mycologist can identify. An experienced mold inspector will be able to collect the samples in a fashion that a trained mycologist can readily identify the mold genus. What should I do if I find Stachybotrys chartarum? Occupants in the affected area should be notified by the building owner or other appropriate person. Health risks and remediation methods cannot be predicted based simply on the presence of Stachybotrys chartarum in the building materials by sampling results alone. 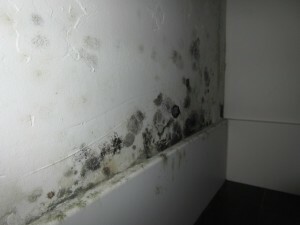 Elevated airborne mold spore levels cannot be assumed by the presence of mold growth on the building materials. An exposure route has to be present. Depending on the extent of the contamination problem, different levels of containment are necessary for remediation of Stachybotrys contaminated building materials. Clean up should be conducted when the affected areas are unoccupied. Personal protective gear must be worn by workers at all times. Consultation with and evaluation by a Certified Microbial Consultant may be advisable if sensitive population is present or the mold growth is expected to be > 10 sq. ft.
Post-remediation verification can document the efficacy of the remediation and provides an assessment for re-occupancy. Should you suspect a mold problem and would like to speak to trained and certified microbial consultants, please call us at 760-804-9400. 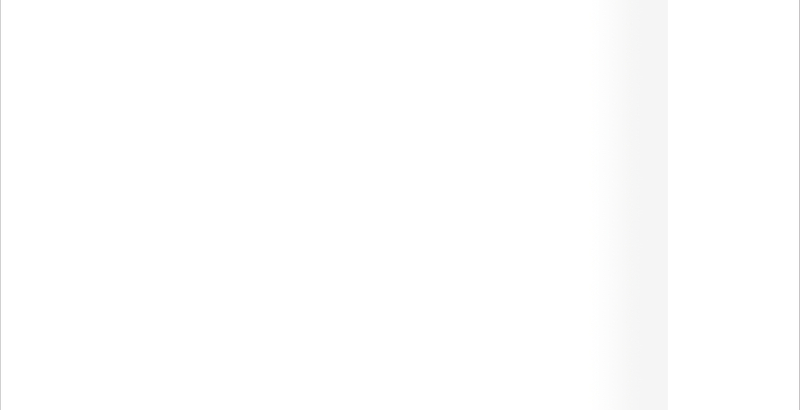 – Environmental Testing & Technology, Inc.